One of the biggest drivers of a pitcher’s ability to rack up swinging strikes — and ultimately strikeouts — is velocity. Every pitcher has swings in speed throughout the season that can have meaningful impact on fantasy performance. In some cases, pitchers may experience an uptick in velocity as they fix a mechanical flaw, change their approach or are simply healthy. Lost mechanics, fatigue or injuries can slow pitches down. Spotting such velocity changes can help you be ahead of the curve when setting your daily fantasy rosters. Among qualified starters, Matt Boyd of Detroit has seen the largest increase in fastball velocity over the last 30 days compared with his seasonal fastball velocity. 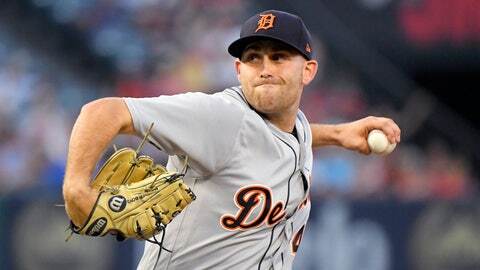 Not surprisingly, Boyd struck out 26.3 percent of batters faced in five July starts. In the three months prior to July, Boyd had strikeout rate splits of 15.2, 22.5, and 22.3 percent. Boyd is likely to be a low-owned second starter on DraftKings over his next few starts. Other velocity gainers include a couple Mets, Jacob deGrom and Zack Wheeler. Look for deGrom’s dominance to continue. Another velocity gainer who will potentially be a low-owned starter in the coming weeks is Mike Minor of the Rangers, especially if he can find a favorable matchup outside of Texas. While he has pitched well recently, Seattle’s Marco Gonzales has seen the biggest drop in velocity among qualified pitchers. In Gonzales’ case, the small velocity drop may not matter, but he did have two of his four lowest swinging strike rates over his last four starts. The other two starts were against the White Sox and Blue Jays, who rank first and seventh in MLB swinging strikes. You may want to tread carefully with Gonzales in the near future and even consider rostering some lower owned bats against him in tournaments in the right spots. The PGA Championship will be held at Bellerive Country Club just outside of St. Louis. Bellerive will play as a 7,316-yard par 70, featuring just two par 5s, both of which measure nearly 600 yards in length. The course last held a PGA Tour event in 2008 when Camilo Villegas won the BMW Championship. That year, the top 15 players in strokes gained tee-to-green gained 17 percent of their strokes off the tee, 77 percent on approach and just 6 percent from around the green. While distance always is an advantage, the shorter players on tour can still contend if they are dialed in with their irons. For the second week in a row, Justin Thomas is one of DailyRoto’s top values with 42 percent probability to finish inside of the top 20 at a price of just $9,700 on DraftKings. Coming off a victory where he averaged 1.91 strokes gained on approach per round at the WGC Bridgestone, Thomas finds himself in position to defend his PGA Championship title. While he known by many for his driving distance, Thomas has an incredibly balanced game and rates second in this field in strokes gained on approach over his previous 50 rounds and gained strokes in all four categories. The only downside with Thomas this week is that his victory last week and at last year’s PGA Championship will lead to elevated ownership. In fantasy golf contests that pay out a high percentage of money to first place, sometimes going contrarian by pivoting off of popular plays is a profitable strategy. DailyRoto’s favorite contrarian option this week is Justin Rose who offers better top 20 odds (46 percent) than both Thomas and Brooks Koepka but will be used by fewer users. Rose withdrew from last week’s WGC Bridgestone with back spasms, and those concerns will leave some avoiding him, but he is still respected in the betting markets and rates inside the top 20 in this field in strokes gained off the tee, approach, around the green and putting. It is challenging to forecast what type of golfer the course may benefit, so Rose’s balanced game is an asset to fantasy golfers. With many opting for the safety of Thomas or Koepka, don’t be afraid to take on some risk with Rose in a high-reward spot.